How are plants structured? How do they adapt to their environment? The answers to these and other questions about complex plant processes, written in everyday language, allow gardeners and horticulturists to understand plants from the plant's point of view. Photos & illustrations. From the Back Cover What happens inside a seed after it is planted? How do plants reproduce and grow? What roles do minerals, air, and light play in the life of a play? 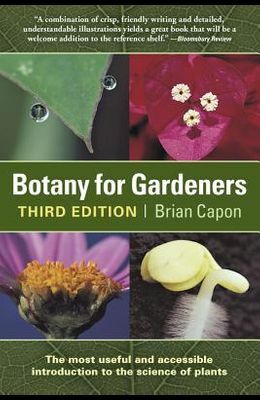 Still the most complete, compact, accessible introduction to the world of botany, this third edition includes dazzling electron microscope photos and even more amazing facts about plants. From plant anatomy to basic genetics, this marvelous book explains the science of plants in plain language anyone can understand. From the front Cover Botany for Gardeners offers a clear explanation of how plants grow. What happens inside a seed after it is planted?How are plants structured?How do plants adapt to their environment?How is water transported from soil to leaves?Why are minerals, air, and light important for healthy plant growth?How do plants reproduce?The answers to these and other questions about complex plant processes, written in everyday language, allow gardeners and horticulturists to understand plants from the plant's point of view.A best-seller since its debut in 1990, Botany for Gardeners has now been expanded and updated, and includes an appendix on plant taxonomy and a comprehensive index. Two dozen new photos and illustrations make this new edition even more attractive than its predecessor.